Spot silver prices continued to take their cue from the gold price yesterday, edging higher following Tuesday’s strong surge and, more significantly, moving past the previous top at $17.30 where the shooting star candle signalled the eventual fall back with silver losing almost $2 per ounce in the process. Whilst yesterday’s move was less dramatic, the bullish tone remains firmly in place for the industrial commodity, and the key level at $18.50 is now firmly in view. With the 9 day moving average about to re-cross the 14 day average, this should provide a further bullish signal in due course, and coupled with the break above the previous top, and a deeper advance into the current congestion at this price level, the signs are encouraging that the move should continue with renewed vigour once the market has taken a step back from the last two days, lthough it would be no surprise to see a minor pullback in the short term as silver traders bank some profits before buying into the move higher once again. 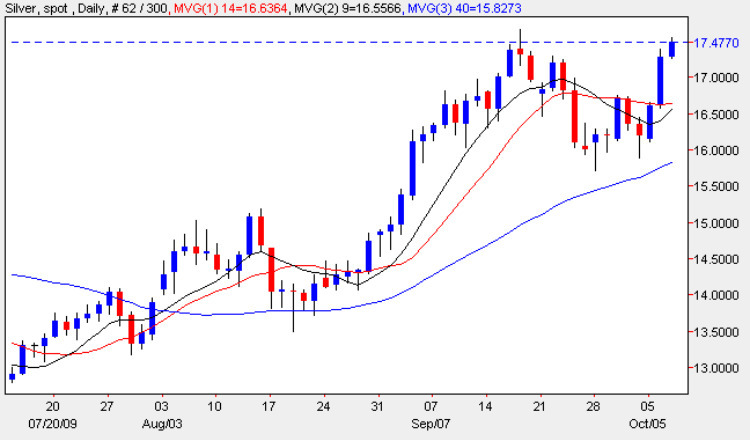 The short term outlook for spot silver prices is bullish, the medium term is bullish and the long term is sideways.